While prevention is always preferable to treatment of any disease, it's especially true of bloat. Most fish afflicted with bloat will soon succumb. Good aquarium husbandry and careful observation of your fish can prevent the pathogens causing bloat from affecting your tank. Bloat isn't a disease per se, but a syndrome found in tropical fish. It also goes by the names Malawi bloat -- for cichlids -- dropsy and edema. Whatever you call it, affected fish experience swollen abdomens, which causes their scales to stand out. Other symptoms include breathing difficulties, appetite loss, lethargy, red marks on the body and long, white excrement. It's not a subtle condition; your fish is obviously very sick. Bloat might result from bacterial, protozoal, viral or parasitical infections. Although the cause varies, the results are the same. The fish's abdominal cavity fills with fluid, affecting the vital organs within. A stressed fish, with a weak immune system, is more likely to develop bloat than an otherwise healthy specimen. It's usually not possible to diagnose the cause of bloat in a living fish, but you can take the dead fish to a veterinary pathologist to determine what caused the condition. Unfortunately, bloat usually proves fatal. 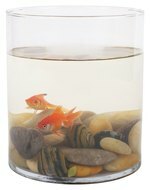 For humane purposes, remove the fish from your tank and euthanize it. Prompt removal can prevent the pathogen from infecting other fish. If you catch the condition very early -- prior to any actual swelling -- adding antibacterial medication to the aquarium might keep the edema from worsening. Of course, that's if a bacterial pathogen is causing the problem. If any of your fish stop eating, that's a sign that something is wrong. Suddenly swimming alone and avoiding other fish is another sign of imminent edema. Bloat prevention falls into two primary categories: food and water quality. Feed the proper type and amounts of food for the fish in your tank. Certain fish, such as cichlids, need a vegetable-based diet. Avoid unduly stressing your fish, including overcrowding. 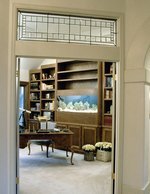 Provide lots of hiding places and cover in the aquarium. Maintain good water quality, pH level, temperature and nitrate and ammonia levels. Change water regularly, maintain the filter and clean the substrate via siphoning. Certain fish are more prone to bloat than other species, including goldfish, mollies and various barbs.